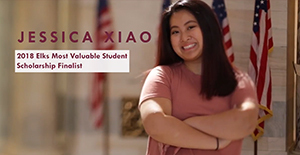 Jessica Xiao is a 2018 Most Valuable Student scholarship finalist from Oregon who was recently featured in our "The Future Looks Like..." video series. Jessica is studying computer science because she wants to pave the way for universal access to "all of the technology that we're inventing in our world currently." She also wants to thank the Elks, and give them a few hugs, for giving her the opportunity to follow her dreams. Watch her short video (1 min., 40 secs.) on Facebook or YouTube. Enjoy! Elks National Foundation © 2019 All rights reserved.